We Are In Love feat. Ryan Davis Harry Connick Jr.
New Big Band fan? Old Big Band fan? Big Band Atlanta plays it all – the Standards from The Great American Song Book and the raucous, original, new and funky Big Band music you won’t hear anywhere else. 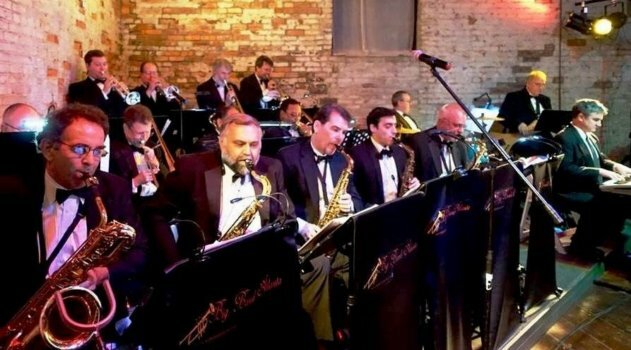 We are among the best and most reputable Big Bands in Atlanta and look forward to making your special engagement something exciting to remember. Led by Music Director Dave Rickard, Big Band Atlanta features many of his new and original compositions. We are a powerful 18-piece horn band that plays big and soft, old and new – and all combinations in between! Frank Sinatra and the Star Wars theme! Glenn Miller, Benny Goodman and Grief Mobile. Louis Armstrong, Count Basie and…Mingus, McIntosh, Mintzer, Florence and Metheny. So, whether you are looking for a nostalgic walk down memory lane, a wild ride to parts unknown or something in between – we’ve got you covered! Check out our Partial Song List below – but keep in mind it’s just a small sample! Let us know what you want to hear, and we will play it! A typical event includes live music over a 4-hour period, with breaks arranged around your event schedule. During breaks, we are happy to play the background music of your choice over our PA. And you can use our PA to make your own announcements or request that we provide Emcee duties for you. And, as important as the music is, we also pride ourselves on the very personal attention we give you and your event. We have fun making it all about you and being easy to work with. We want to know your vision, your priorities – and how we can make it all happen.